Last year I decided to read every single book a student, colleague or friend assigned me - the good (Bossypants), the bad (more than I can mention here) and the ugly (The Uglies, an actual YA book, I can't make this up). I made it to Book #129 around May 2015, discovered Netflix, then fell into the joy of cooking for veterans. Then I saw Isabel Allende published a new book, and without waiting for anyone to have the sense to assign me this book, I assigned it to myself. I downloaded it on iBooks back in late November, and read paragraphs on my phone here and there while avoiding grading and things like that. Truly, the author (who I love, respect, honor, and cherish, and did I mention I love?) 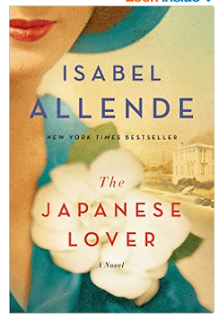 lost me for a minute when a main character came to the US from Japan in the early 1920s, which would have been in contravention of the 1908 Gentleman's Agreement between the US and Japan regarding migration. I put the book down and fell into professorial things and mom things and then holiday things. Today I opened the book again and read it for hours, silently suffering along with the characters as they witness the holocaust, internment, Texas and their own bad choices. This book captures a love that goes beyond anything that can be earned, anything that can be signed into a contract, anything that can be bound and limited. Of course, love stories don't always have happy endings (or beginnings, or middles, but I digress) and even though I expected a Nicholas Sparks-esque crazy sad ending, Isabel Allende served something better and more beautiful than I could imagine, creating an ending that had me sobbing fat tears and wiping my mascara off with paper towels while squinting to keep reading every beautiful word.